Hamburg, PA., – Tune in to the NRA Freedom Friday lineup on Pursuit Channel as Doug Koenig returns to an all steel knockdown competition in his home state of Pennsylvania. After taking a ten year hiatus from this match, Doug has to re-familiarize himself with the course of fire and shoot the Texas Star, Pepper Poppers and Steel reactionary targets as smoothly and accurately as possible. Shooting in the Open Auto Division with a centerfire handgun, loaded with ten rounds, it’s a blast watching ‘The Champ’ push through while enjoying himself. Taking a few minutes out from the match, Doug introduces two new Safariland concealment holsters for the M&P Single Stack Slim Pistols and demonstrates how easily Chamber-View empty chamber inserts fit into a variety of firearms. 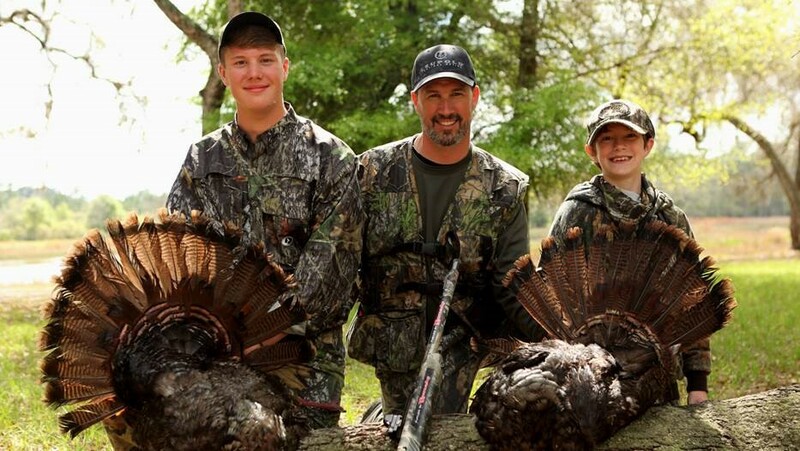 Then, Doug and his sons travel to Florida for a combo Osceola Longbeard Turkey and wild hog hunt. As the boys impatiently wait for a response to their hen yelp calls, unexpectedly a group of wild hogs walk by and gets everyone’s attention. 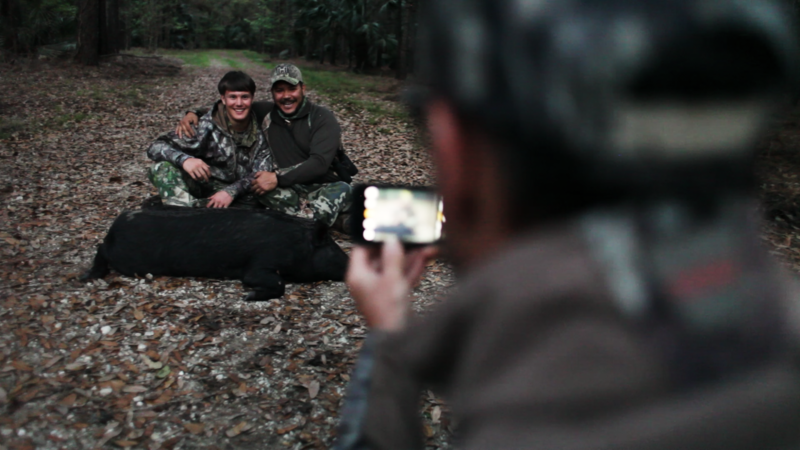 Tune in to see Trevor’s reaction and his first Florida hog. Doug Koenig’s Championship Season can be viewed on Pursuit Channel, or it streams live at: http://www.vidillion.tv/pursuitchannel/. Doug Koenig’s Championship Season returns to Pursuit Channel. From remote hunting destinations to the firing line, join your host and world shooting champion Doug Koenig on his quest for the ultimate trophies. Championship Season features a gritty combination of fast-paced shooting competition and in your face hunting adventures. Whether it’s a bull elk, whitetails or competition shooting, one this is certain. . .bullets will fly and it’s gonna be a wild ride! 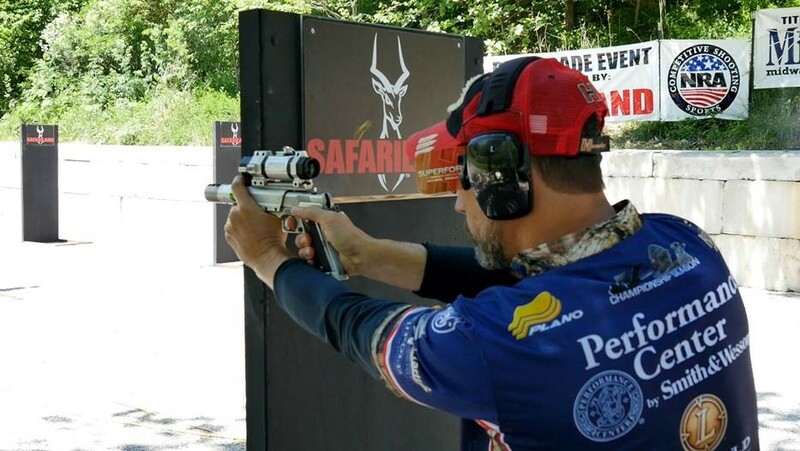 Hamburg, PA., – World Champion Shooter Doug Koenig recently won three Carry Optics Division titles at the United States Practical Shooting Associations Area 3, 7 and 8 matches. All three competitions held within the past thirty days, began with Area 3 in Grand Island, NE, Area 8 in New Tripoli, PA and Area 7 in Harvard, MA. Koenig skillfully dominated the majority of stages, shooting Hornady 115 grain XTP bullets in his S&W M&P Core pistol topped with a DeltaPoint Pro Reflex Sight. Doug closes out his 2017 competition season with the upcoming East Coast Steel Challenge and the USPSA Iron Sights National Championships. In October, Doug will make his debut as an NSSF Fantasy Camp instructor in Las Vegas, NV. Doug Koenig is a world-class professional shooter whose list of achievements and championship wins is daunting as he approaches his 30th year of competing. Koenig began shooting competitively at 17, winning both regional and national competitions. In 1990, Doug turned professional as a competitor and the decision paid off scoring an unprecedented 1920x in the NRA’s Bianchi Cup. Doug now hosts his TV show, “Doug Koenig’s Championship Season” promoting an outdoor lifestyle for families, provides hunting and shooting tips and demonstrates what it takes to become a world-class profession champion. Hamburg, PA., – In this week’s episode, it’s the conclusion of the NRA World Shooting Championship match. Doug, along with many of the top guns of the sport are hoping to ace the twelve stages which represent all the major shooting disciplines. With each stage worth 250 points for a total score of 3,000 it’ll be a close call to see who will claim top honors. Then, Doug takes to the skies for a trip to the western shores of Scotland and revisits with third generation Head Stalker and Sport Manager Niall Rowantree of West Highland Hunting. 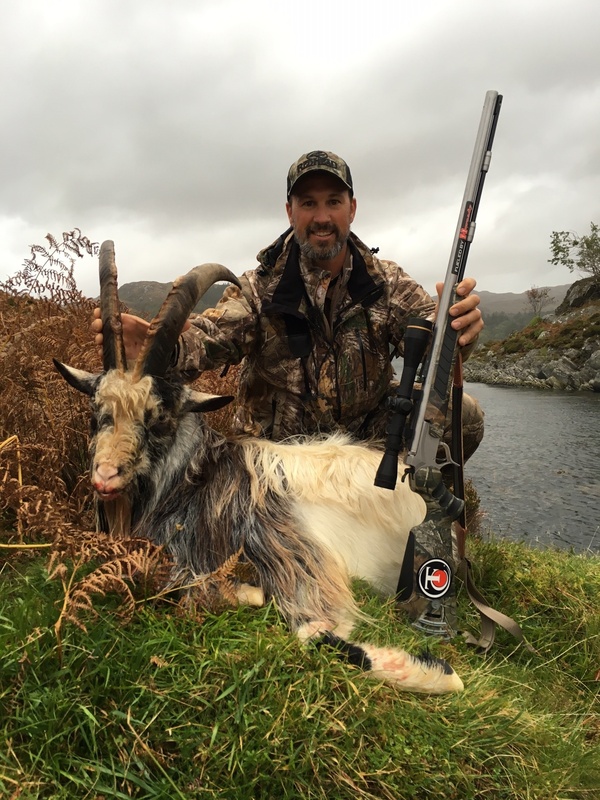 As part of a goat management plan on the surrounding islands of the hunting estate, Doug sets out for a long-horned feral goat with his TC Pro Hunter Muzzleloader. Making way up a steep rocky hillside covered with heather and gale winds blowing sideways, it’ll be a challenge to hold steady and take that trophy shot. Tune in to see more of this beautiful Scottish Highlands hunt. Doug Koenig’s Championship Season can be viewed on Pursuit Channel, if you don’t subscribe, watch the show stream live at: http://www.vidillion.tv/pursuitchannel/. Above: Doug Koenig shooting the Precision Rifle Series stage at last year’s NRA World Shooting Championship. When SSUSA last spoke with Doug Koenig, he was fresh off his victory at the 2016 NRA World Shooting Championship. Earlier this year during a conversation at SHOT Show, he filled us in on his plans for the Bianchi Cup, continued innovation with incorporating physical fitness into his training, as well as the 30th anniversary of the famed Sportsman’s Team Challenge—Koenig will be serving as match director for the second consecutive year. As if his year couldn’t get any busier, Koenig also plans to begin competing in the high power rifle disciplines. 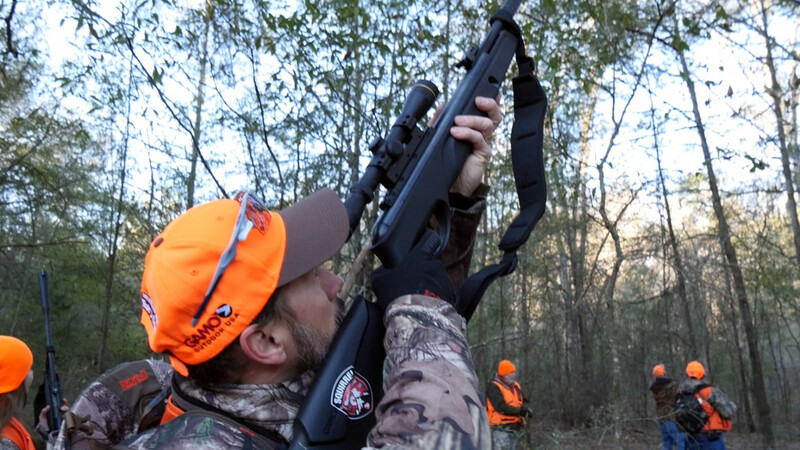 Read on for the latest news from one of the best athletes in the shooting sports. Shooting the mover during last year’s Colt Championship Final at the NRA Bianchi Cup Action Pistol Championship. The NRA Bianchi Cup Action Pistol Championship and the name Doug Koenig are nearly synonymous these days, given his unprecedented 17 wins at the world’s most prestigious pistol match. Koenig’s past performances on the sport of action pistol’s ultimate stage are the stuff of legends. His shooting at the championship in 1990 resulted in the first perfect score fired ever in the history of the championship, at subsequent championships he shot 16 total perfect 1920 scores. Additionally, Koenig has the honor of the highest score ever fired at the match—1920-187X. This year NRA has made a change in determining the winner, so it might be a bit more difficult for Koenig to win a record breaking 18th Bianchi Cup. The 2017 Bianchi Cup Champion will not be determined by combining the aggregate score of the first four events (also known as Match X) and the Colt Championship Final score—which was the case in 2016. This year, competitors in the Colt Championship Final will once again shoot for a 1920. The highest score out of a possible 1920 in the Final will become the 2017 Bianchi Cup Champion. Koenig tailors his physical fitness regimen to improve his shooting speed and stability. Koenig has participated in the Sportsman’s Team Challenge in one way or another for many years. The STC is an ideal match for groups of competitive shooters with varying skill levels. “The course of fire at the open level is difficult, the time limits can be tough. As it trickles down the ranks it’s challenging, but a lot of fun. Because of the team aspect of the STC, it adds a different dimension than just going to a 3-Gun match by yourself and shooting. It’s always fun to work together with someone and pass the responsibilities to your teammates. Teams try to use each other’s strengths—so that the pressure is not just on one shooter,” said Koenig. Shooting long-range rifle from a barricade at last year’s NRA World Shooting Championship. Learn more about Doug Koenig at his website: dougkoenig.com. 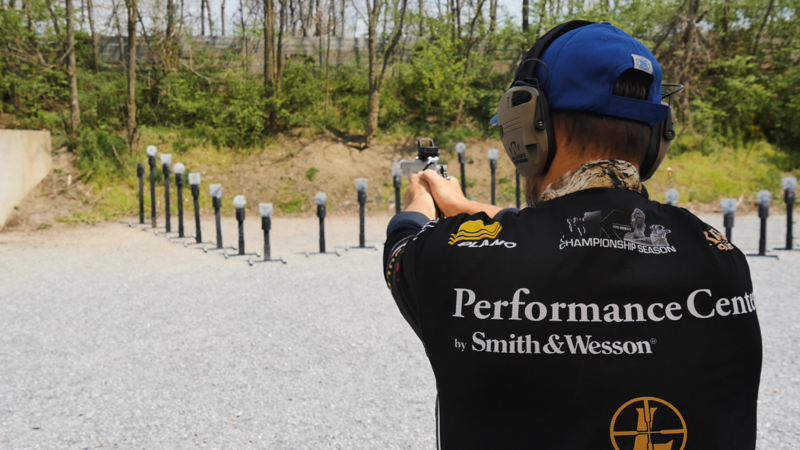 Hamburg, PA; – Pursuit Channel welcomes Doug Koenig’s Championship Season to NRA Freedom Friday lineup at 10:00 pm EST. This week’s show includes a special moment as Doug and his two sons hunt Turkey in Florida; then Doug and Trevor compete at the Sportsman’s Team Challenge National Championship in Marble Falls, Texas. Pursuit Channel welcomes Doug Koenig’s Championship Season to NRA Freedom Friday lineup at 10:00 pm EST. Doug’s in Columbia, Missouri at the Green Valley Rifle and Pistol Club in pursuit of his 16 th Bianchi Cup. As the weather unexpectedly changes, competitors are faced with unsettling cold temperatures, rain and changing winds unfit for the fainthearted, but where champions persevere and regroup. Post Bianchi Cup celebration, the rains follow Doug as he travels with his two sons to Ocala, Florida for Osceola Turkey. Will the guys be able to hold on and call in a Tom? You’ll have to see for yourself. Pursuit Channel presents Doug Koenig’s Championship Season on Friday nights at 10:00 pm EST, as part of the NRA Freedom Friday lineup. Doug hits the road and heads to Lincoln County in Kansas for a central prairie turkey hunt. After a storm from the night before, the hens finally fly off the roost to join the strutting Toms all puffed out in full plumage. It’s a 30 yard shot for Doug and he’s happy. Hamburg, PA – Pursuit Channel welcomes Doug Koenig’s Championship Season to NRA Freedom Friday lineup airing 10:00 pm EST. It’s a trio of Koenig’s on the range at the US Steel Nationals in Florida, as youngest son, Bradley makes his shooting debut in the Rimfire Division. Doug tries to strike a balance as the calming coach and anxious father standing behind the shooters box. A new generation of Koenig’s emerge at the range, ensuring a bright future for the continuation of the shooting sports. Pursuit Channel welcomes Doug Koenig’s Championship Season to NRA Freedom Friday lineup airing 10:00 pm EST. 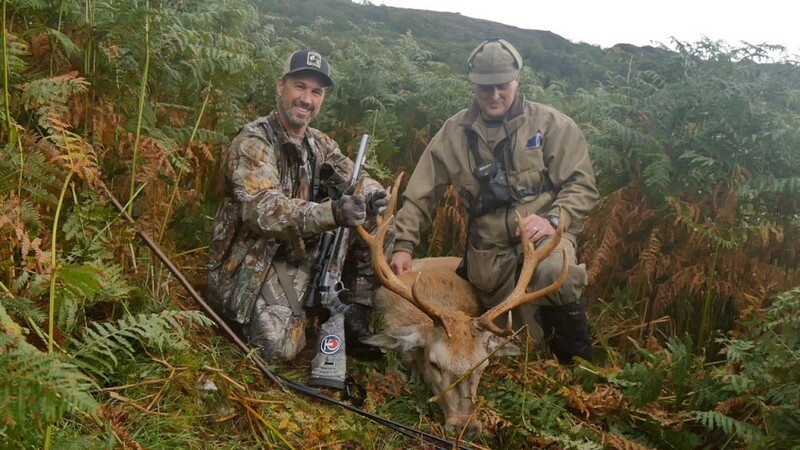 Doug travels to Argyll, Scotland for a Red Stag hunt. With fresh rubs noticeable along the mountainside trail, Doug’s guide leads him through patches of purple heather towards a bedded down Stag. As Doug steadies his TC Encore® Muzzleloader, topped with a Leupold® Ultimate Slam 3×9 CDS, guide Niall Rowantree glasses one last time for the perfectly aligned shot.